The summer season is all about enjoying wonderful produce like fresh tomatoes and basil, which this tomato mozzarella salad is all about. Made with buffalo mozzarella, campari tomatoes, and Italian basil, it’s hard not to enjoy every single bite of this salad. One of the best parts about a tomato mozzarella salad like this is that it requires minimal effort to create. During the dog days of summer, when all you want to do is lounge around in a cool spot with a glass of lemonade, there’s little desire to get up and cook anything in the kitchen. This tomato mozzarella salad, however, is incredibly easy to prepare. We love serving the mix on toasted pieces of baguette for a light lunch on a hot day. A drizzle of olive oil and/or balsamic vinegar, with a pinch of freshly ground sea salt and pepper is all it takes to turn this tomato mozzarella salad into a divine meal. If you can’t find buffalo mozzarella or campari tomatoes at your local store, you can easily swap them with a fresh mozzarella ball and plum tomatoes. Just be sure to slice up the mozzarella and tomatoes into smaller pieces so that they fit onto your bread slices. Cut your ciabatta loaf or baguette into 1/2" thick slices. Toast the bread slices. In the meanwhile, cut your campari tomatoes into 4 quarters. Slice the mozzarella balls in half. Chop your basil into finer pieces (doing a rough chop or a julienne cut). 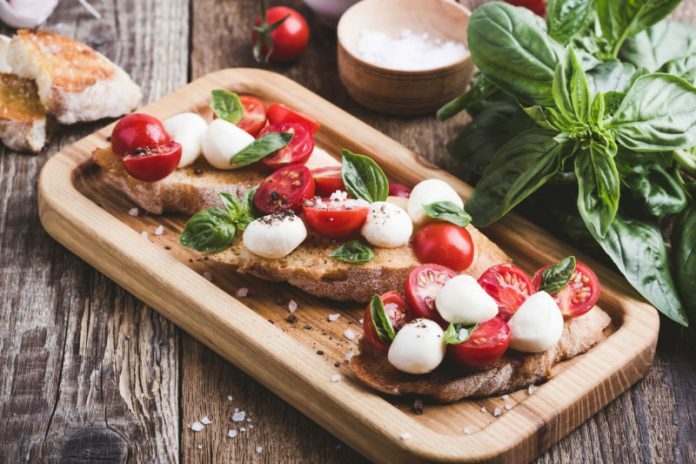 Arrange the tomatoes and mozzarella onto the toasted bread slices. Drizzle olive oil then balsamic vinegar over the top. Top with a pinch of salt and pepper. Garnish with some fresh chopped basil.